Is anyone else still baking...addressing Christmas cards...trying to finish those last-minute Christmas presents? I'll be honest. At our house, the baking didn't happen at all this year. Which is bad and good. Bad...because there are no Christmas goodies to munch on. Good...because there are no Christmas goodies to munch on, which might make for a merrier January. Christmas cards...also didn't happen. Mark and I usually find some fun and funky picture taken during the year and that's what makes it to our Christmas card. I don't know. Maybe we didn't do anything fun and funky in 2008. But we love receiving Christmas cards so please don't take us off your Christmas card list. Fun and funky next year--we promise. And the last of the Christmas presents will be finished today. *sigh* Then I can just sit back and enjoy the lights on my tree. Lights on my tree...which makes me think of my holiday decorations, which actually got put up pretty early this year. I know. Some people have "themes." 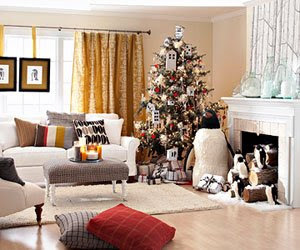 The holiday magazines are filled with all these "decorator" Christmas rooms. I love looking at them. But really? My heart is warmed by the things we have put up for years. It is comforting. So my house will probably never have a "penguin" theme. Nope. Instead we have this little trio. We have had them for years, for so long that I can't even remember where we got them. I think we got the strainer reindeer in Kansas, which means he is over thirty years old. We got the little soda can "caroler" when Aaron was small and for some reason it reminded us of him (I'm sure he will be happy to read that...). And the little basting brush Santa has been around for quite some time too. And they all live happily together year after year. Okay, I have serious refrigerator-envy all year long...except for Christmas. Aaron and Christa have one of those fabulous "French door" refrigerators. You know the kind--with the double doors on top and the freezer unit on the bottom, satin-finish silver, beautiful...This snowman is the ONLY thing that makes me glad to have my old white refrigerator. Snowman fridge beats penquin theme any day! I put my Post-it on the snowman! Actually, I really like the dish holding the pepper-nuts!